I had hoped to post this morning, but it didn't work out. I just want to say a big "Thank you" to all of our veterans and the men and women who are currently serving in our military. Thank you for sacrificing to serve our country and protect our freedoms! My father, father-in-law and my husband all served during war time, and I'm very proud of them. God Bless all of you on this Veterans Day and every day! And of course, this is a recipe blog, so we must have food! 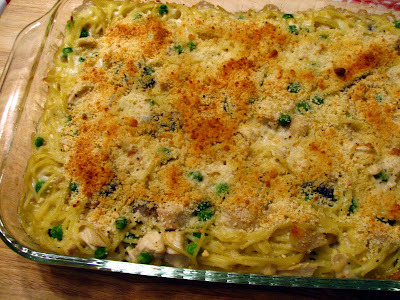 I made this yummy Tetrazzini this week only I used chicken instead of turkey. But of course, left over Thanksgiving turkey is perfect for this dish. I included the mushrooms this time, even though my son protested. He says he does not like "fungi" in his food, but I just didn't listen to him! This is comfort food with the creamy Parmesan sauce, mushrooms and pasta. I found this recipe at Epicurious a few years ago and it has become a staple in our family. I hope you enjoy it. A white sauce is made with milk, flour and Parmesan cheese, and then mixed with turkey or chicken and some pasta. Add in the mushrooms and peas and top with crumbs. Dot with butter. Bake until golden and bubbly. It's a comforting casserole that is so good any time of the year, but especially in the colder months. Serve with a veggie or salad and maybe some crusty bread. Cook the spaghetti to package directions. In a large, heavy saucepan cook the mushrooms in 4 tablespoons of butter, over medium heat, stirring until most of their liquid they give off has evaporated. Stir in the flour over low heat for about 3 minutes. Whisk in the broth, milk and half and half. Bring to a simmer and cook until sauce has thickened. Stir in 2/3 cup of Parmesan cheese. Add the peas and salt and pepper. Taste and add more salt or pepper, if needed. Mix in the cooked, drained spaghetti and transfer the mixture to a buttered 3 quart casserole dish. A 9x 13 baking dish works for this dish. In a small bow combine the remaining 1/3 cup of Parmesan, the bread crumbs and 1 T. melted butter and sprinkle over the Tetrazzini. Dot with the remaining tablespoon of butter. Bake in a preheated 375 degree oven for about 25-30 minutes, or until it is bubbling and the top is golden. Dig in! How do you use left-over turkey? WOW! This is really good for family gathering. I haven't made tetrazzini in ages because it makes so much. Now I'm thinking perhaps I could make some up after Thanksgiving dinner for guests to take home and cook for part of their leftover goodies. This is a very tasty dish! We don't cook spgahetti this way at all.. 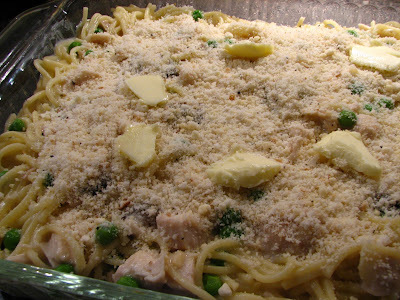 I've been craving tetrazzini lately - your recipe looks wonderful. What a lovely recipe. Timely too. I always make this right after the holiday to help retire leftovers. 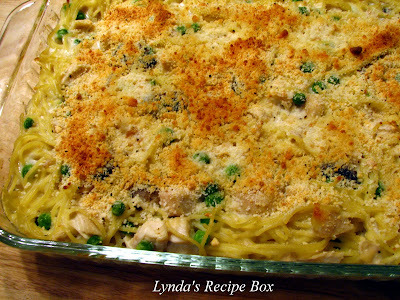 Lynda, this is one of my favorite 'go-to' comfort foods. This looks absolutely marvelous! Looks very yummy. Tetrazzini is an oldie but goodie. Wow I have heard of but never seen that recipe made. I gotta give it a try! Thanks for sharing! Oh my gosh that looks amazing! And perfect. Yummo!! This sounds super delicious! I've just announced a new 5 Star Makeover challenge for Thanksgiving leftovers and this would be a perfect entry - please let me know if you would like to participate! 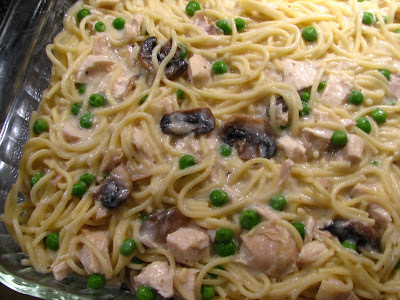 I have been meaning to make turkey tetrazzini for such a long time! This looks like the perfect use of leftovers.